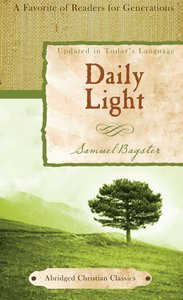 Compiled by Samuel Bagster, Daily Light is a Christian classic made up entirely of selected Scripture verses arranged according to pertinent themes. Samuel Bagster was a noted London bookseller born in the eighteenth century. The patriarch of his family, he established a strong tradition of daily family Bible reading. His son Jonathan and other members of his family drew from this heritage as they developed Daily Light on the Daily Path, which has become one of the most beloved classic devotionals of all time. Bagster and Sons, the family business, became a respected publishing house of Bibles and Bible reference books in the nineteenth century.